Buy this beautiful cypress-framed Atchafalaya Basin sunrise print. 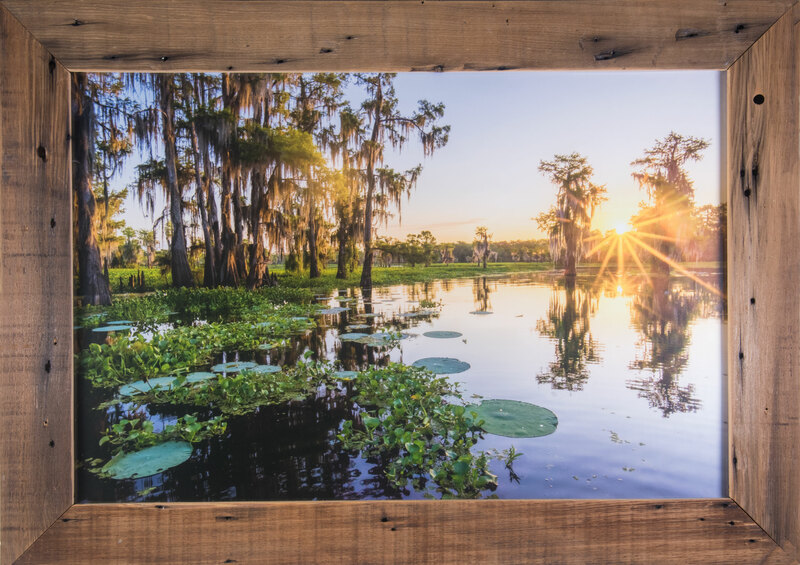 A sunrise from the middle of the Atchafalaya Basin is stunning, and you can enjoy the experience every day when you purchase this beautiful print below. And the reclaimed cypress frame perfectly matches the amazing scene, accentuating the experience of being in the swamp. The photo was taken near Duck Lake early one summer morning as the sun popped over the cypress trees lining the swamp. This special 16×24 metallic print comes ready to hang, and is beautifully framed by by David Imbroguglio of FarmerDave’s Frame Shop using reclaimed cypress from a house in Donaldsonville, La. The non-glare ensures the beauty of the image is not affected by the glare of lights. Special metallic paper is used to bring out the colors and make the sunrise almost jump out of the frame. The image will transport you right into the middle of the swamp, and will add beauty to any home or office. The framed print costs only $200, including local pickup or delivery in the Greater Baton Rouge area. Shipping also is available, with the print custom packaged and sent by UPS.